Are you ready to start your new car search for the best cars for sale in Olympia WA for the year? 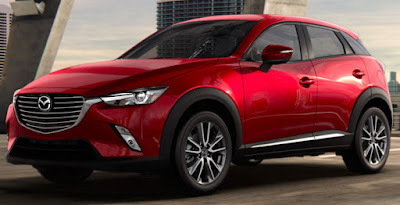 2016 is all about saving the environment, fuel and money and with the fuel-saving 2016 Mazda CX-3 Grand Touring, you can do just that, while driving around in style. This particular Mazda model is undoubtedly designed for the road trip enthusiast and will not disappoint when it comes to comfort and style. After all, what modern road trip doesn’t include a few luxurious perks? This model earns itself great reviews in the subcompact cross-over category in the motoring world! • 18 inch aluminum alloy wheels. • I-ACTIV AWD™ all-wheel drive system can monitor weather conditions to adjust power and traction automatically. • Offers up to EPA-EST 35 HWY MPG. • Radar cruise control with close proximity warning. • 16-valve 4-cylinder engine with 146 horsepower. • Electric Power Assist steering (EPAS). • Power door locks with 2-stage unlocking. If the 2016 Mazda CX-3 Grand Touring sounds like the type of car that should feature on the top of your new car search, then take the time to browse through our vehicle inventory at Olympia Auto Mall. We stock new and certified pre-owned vehicles and will ensure that the vehicle you buy is one that will add value to your lifestyle while going easy on your pocket. If you need assistance with vehicle finance for your purchase, simply let us know and we can assist you. I was looking for a new car and I see this post. Thanks for your recommendation. This is my old car . The car was really fascinated me with the specs are impressive. Thank you for sharing the information, I will find out and contact buy it soon. Wow, this car is great. I'm looking for a new car and I think I will chose this car. Thanks. This car sounds very suitable for road trip. I think I'll buy it if I buy a new car. Thanks so much!